Scroll through Pinterest or your favourite interiors magazine and you could be forgiven for thinking that everyone has a huge bathroom with ample space for a free standing tub, a walk in shower and twin basins. The reality, at least here in the UK where home sizes have been shrinking for the last couple of decades, is a little different for most of us. A lot of bathroom suites seem to have been designed for generously sized rooms where space isn’t a problem, but what if you need to find a solution for a tight space - an ensuite perhaps, a downstairs cloakroom or maybe, like us, you just have a really small bathroom to work with. We recently moved into a 1930s house and many homes from that era typically have pretty small bathrooms - ours is tiny. We initially considered relocating it by swapping it over with the smallest of the three bedrooms so that we’d have some extra space to work with, but in the end decided against it and we’ve now turned the smallest bedroom into a walk in wardrobe instead. So we’re left with trying to redesign a tiny bathroom that needs to accommodate both a bath and shower. It’s a tight brief, but we’re ready to rise to the challenge. We won’t be compromising on style though. Because it’s such a small space it has to be designed to be both practical and look good. Everything is thrown into sharper focus in a smaller room so it’s even more important to pay attention to design details and we really wanted to choose a basin that would set the tone for the space style wise. Here are some of the best compact and space saving options I’ve tracked down. Some of the designer collections come with a fairly eye watering price tag admittedly, but I’ve included them because I think they provide a useful indication of where bathroom trends are heading and some of these style influences will probably eventually filter down to other collections at a more accessible price point. So which one did we go for? Well you’ll have to wait a little while to find out until we finish our bathroom makeover and then all will be revealed. Wall hung designs are a great choice for small bathrooms like ours where every inch counts because by freeing up the floor area they create the impression of additional space. The GSI Kube comes with an optional towel rail and is available with a choice of 0,1 or 3 tap holes allowing you to configure it with either wall or deck mounted taps. Part of a versatile modular collection by Norm Architects for ex.t this steel framed basin is styled to create a minimalist, graphic look. Measuring just 400mm by 260mm this Memento hand wash basin by Villeroy & Boch will fit into even the tiniest of cloakrooms. Using colour is one way of creating a strong impact in a small space. This Rho concrete basin - a collaboration between Bert & May and Kast - is available in 5 unique colourways including this rich earthy red. Other options include grey and Mandarin (a soft shell pink like neutral). 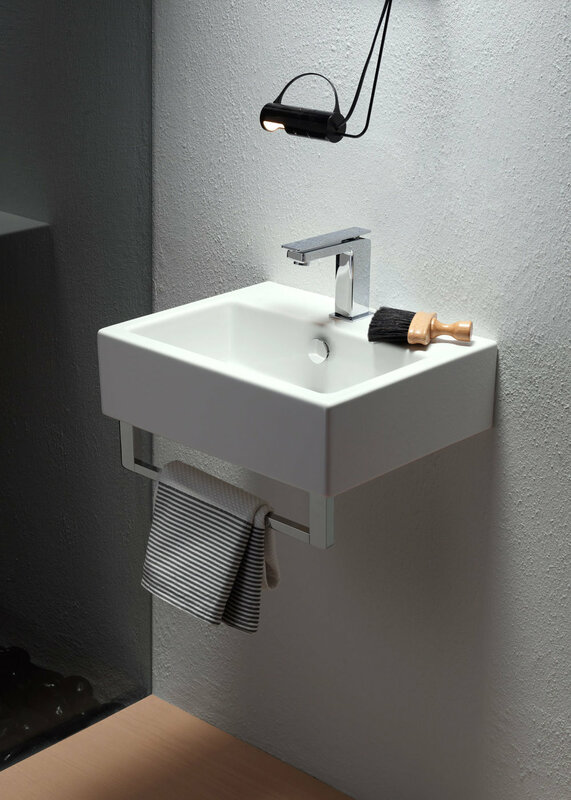 Measuring just 35cm wide its perfect for a counter top in a tight space with wall mounted taps (see our post on 10 of the best… wall mounted taps for similar tap options). With a short projection of just 380mm this minimalist basin from Laufen’s Living collection is ideal for small bathrooms and cloakrooms. This walnut effect unit from Soak.com combines the basin with a pull out two drawer cabinet and a concealed cistern toilet in a neat space saving design. Ribbed designs are definitely having a moment. Fluted glass is starting to pop up everywhere so it’s interesting to see the same effect being used on this concrete wall mounted basin by Last. The ribbed pattern enhances the vertical form and wraps around the curves. The matt black aluminium frame gives this slimline design a minimalist industrial look. The thin edges make it roomier than most other basins of the same external width so it’s a great option if you’re looking for a short projection design but don’t want to compromise on basin size. An oak shelf provides a handy storage place for all your bathroom essentials and there’s also an integrated towel rail. With sleek clean lines and a handy shelf for storing towels or toiletries, Lusso Stone’s Ethos mini basin is one of the most stylish minimalist options I’ve come across - and at a price point under £300 too. Constructed of solid limestone resin it has a silky smooth tactile surface that’s also easy to clean. 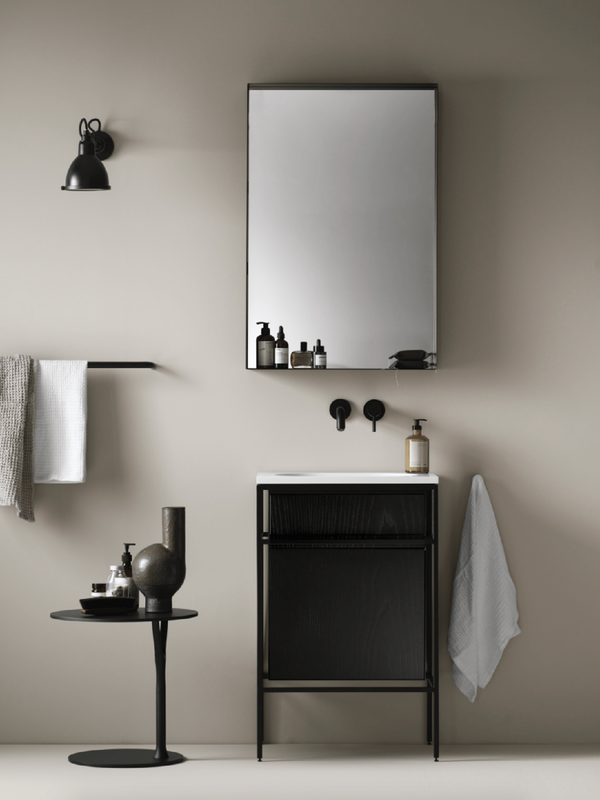 Stockholm based Swoon’s range of minimalist bathroom designs includes a compact vanity unit suitable for even the smallest of bathrooms. It’s fully customisable too - their furniture is available in a wide range of colours and there are also lots of different material and finish options to choose from for the handless and taps, so you can design your dream bathroom online and then have it delivered directly to your home from their factory in Sweden.